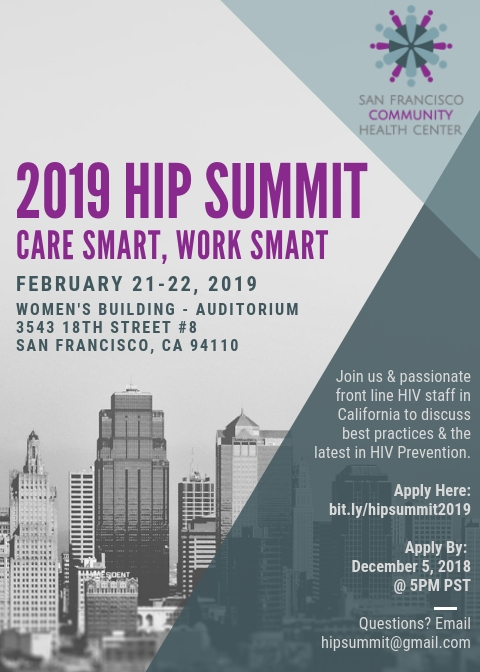 SFCHC’s Capacity Building & Assistance Team is excited to have our 2019 High-Impact HIV Prevention Summit, themed “Care Smart, Work Smart,” in San Francisco on February 21-22, 2019! The Summit will be targeted at direct service providers and frontline staff across California, and will be based around the HIV care continuum. Featuring conversations and workshops about innovative prevention strategies and the challenges of doing prevention work, this two-day event is a space for frontline staff to network with their peers and gain new skills and knowledge. If you are a Director/Manager/Supervisor, the team ask that you please encourage your staff to apply! The goal of our event is to introduce new strategies, build community, and gain a broader understanding of the challenges and potential solutions to best serve the most vulnerable clients. We are excited to review your application so please answer each question in as much detail as possible to be considered. The Summit will be held at the historic Women’s Building (3543 18th St #8) and is completely free to attend. We are able to provide travel assistance on a case-by-case basis to accepted participants. We will notify you of your application status no later than December 12, 2018, 5pm PST. If you are accepted, please plan to confirm your attendance by December 21, 2018, 5pm PST.